In their race to save an unpopular president and their lack of a positive agenda, many Republicans and conservatives increasingly identify the rise of “democratic socialism” as their ultimate, if you will, Trump card. Given the fact that most Americans, particularly older ones, still favor capitalism and are less than enthusiastic about expanding federal power, this approach might work. These same urban hipsters, as opposed to working class ethnics, elected the left’s political stars like Alexandria Ocosio Cortez. Bizarrely, socialism even appeals among the educated young workers so coveted by tech firms. This rise of woke progressivism represents a threat both to the right as well as the super-affluent gentry left. I grew up in an atmosphere where socialist ideas were taken seriously. My paternal grandmother was a member of the Young People’s Socialist League, and a strong supporter of Norman Thomas (my paternal grandfather was a successful dress manufacturer and Republican). My maternal grandfather, a union window washer, spoke openly of the class struggle as if he was still in Russia. Socialism’s appeal stemmed, as it does today, from the failures of capitalism. Until the 1950s, working class people in most industrial countries suffered harsh conditions, crowded into bleak city apartments or isolated in hardscrabble smaller communities. For them, what many conservatives deemed as “socialism” — social security, the GI bill, the New Deal infrastructure program — was seen as helping expand the middle class. The experiences of the working class were very real. My mother was raised in the slums of Brownsville, Brooklyn, and my maternal mother, a seamstress, lived her last years in union housing in that fair borough. Even though most of us were from middle class families, we naturally embraced expanded social democracy, if not of the Norman Thomas variety, certainly that espoused by President Harry Truman, California’s Pat Brown and even President Lyndon Johnson. Conservatives often link today’s socialism with the massive failure of the Soviet Union and the Maoist regime in China. And to be sure, some of today’s firebrands have long demonstrated sympathy to dictatorships in Venezuela and Cuba, and for Rep. Ilhan Omar, even a soft spot for anti-Semitic radical Islamists like Hamas. But even the most addled firebrands know they can’t sell third world despotism, much less sharia law, to the average American. Generally our new socialists pitch European welfare states as their model, with much higher taxes and greater regulation of private businesses. The shapers of modern democratic socialism, such as Michael Harrington, whose The Other America, exposed the vast extent of poverty in early 1960s America, favored a similar system but favored decentralization over of the oppressive Soviet regime. Remember this was a time when most northern European economies were stronger than ours. In recent decades, some of these countries, notably Sweden and Germany, have adopted a more free-market approach as a means of reviving their economies. What’s the matter with the new socialists? With rampant inequality and shrinking middle class, the case for socialism should be stronger than any time since the Depression; many, if not most Americans, certainly would not object to taxing the uber-wealthy much more. But socialism’s leading messengers, reared in the ideological hot-houses of elite universities, also constitute the wealthiest and whitest of America’s political tribes. Not surprisingly the neo-socialists carry attitudes ill-suited for capitalizing, as did Donald Trump, on the mass middle and working class disaffection. All too often they adopt the intersectional, and sometimes openly anti-American, agenda incubated throughout our culture and educational system. Their obsessions with racial redress, including reparations and open borders, seemed ill-suited to winning over most working class voters, something that more seasoned socialists, like Bernie Sanders, recognize. 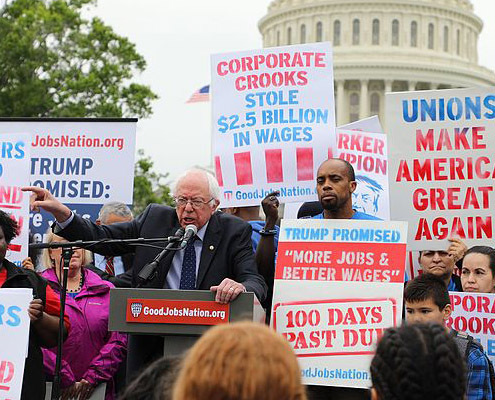 Worst of all, the much hyped Green New Deal would spell disaster for millions of blue collar workers, as the AFL-CIO recently pointed out, particularly those who work in the construction, energy, transportation, farming and manufacturing industries. The original New Deal, recently excoriated by Ocasio Cortez, was about improving the lives of ordinary Americans, not forcing them to downgrade their ambitions, give up meat, live in small apartments and perhaps not even have children. Having never studied the history of the Soviet Union, the new democratic socialists seem oblivious, unlike Harrington, George Orwell and other 20th century social democrats, about the dangers implicit in the centralization of economic and political power. But it’s not just the ditzy left-wingers who need a history lesson. Those on the right, with all their fulsome defense of capitalism, need to be reminded that free markets need to create increased opportunity as well as the better living conditions. Our increasingly hierarchal, and feudal, capitalism all too often fails this test. My fellow capitalists, please remember that only a broadly inclusive version of capitalism can exorcise the ghost of socialism. This article first appeared at The Orange County Register. Joel Kotkin is the Roger Hobbs Distinguished Fellow in Urban Studies at Chapman University and executive director of the Houston-based Center for Opportunity Urbanism. He authored The Human City: Urbanism for the rest of us, published in 2016 by Agate. He is also author of The New Class Conflict, The City: A Global History, and The Next Hundred Million: America in 2050. He is executive director of NewGeography.com and lives in Orange County, CA. Trump Says the U.S. is ‘Full.’ Much of the Nation Has the Opposite Problem. Joel has spoken at many leading universities, business groups, government organizations and more.